It's about 40 years ago now that Tom Morey invented the "Boogie Board"! This fantastic associated discipline of Surfing can sometimes suffer from being less promoted than traditional Surfing but here at GTown...WE LOVE IT and have some local rippers! You can share that experience with us at GTown Surf school. Bodyboarding is a fantastic sport for anyone with water confidence to try. We can get you there and fast! We have some great instructors on our team equipped with the methods, passion and kit to get you ripping across waves in no time at all! So, how do YOU become a Bodyboarder? Book your 1.5 hour "Intro to Bodyboarding" lesson. Come to GTown. Meet & Greet. Kit Up. Recieve Expert Water time with one of our Team. Score lots of Waves. Get Stoked. Learn about how to progress. Let the next chapter of your surfing life begin! AWESOME! 2 hour Bodyboarding lessons with us cost just €35pp and we provide you with a toasty warm 5/3mm Winter wetsuit, Fleece lined Bodyboarding socks, skull cap (if necessary) and a range of performance orientated fins and boards in a range of sizes to maximise your surfing potential. 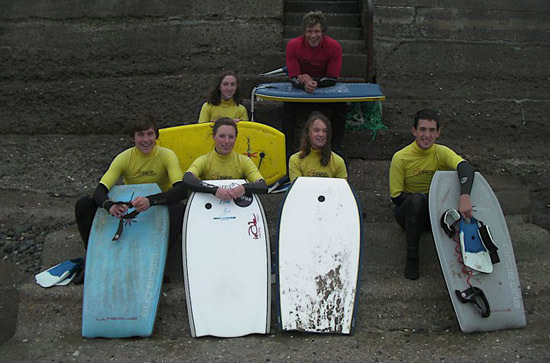 We have a range of surf breaks locally to suit all manner of skills and experience. We have the knowledge and experience to teach you all manner of skills from Surf safety, wave catching techniques, wave riding, spins, getting air and progressive skills such as riding prone and drop knee. Bodyboarding is so much more than you think and Ireland is blessed with some amazing riders and spots to Surf. Don't waste anymore time - Book now and Bodyboard with GTown. Note: Travelling / Visitors / Surfers are always welcome and we have some excellent rental rates and free advice!